If you want to stop the summer heat before if even gets into your home, you need a radiant heat barrier. Radiant barriers are effective at keeping home temps comfortable and energy costs down by reflecting heat before it fully penetrates the house. Tests done on radiant barriers have shown that radiant barrier insulation can reduce heat gains on attic ceilings by about 16 to 42 percent compared to an attic with the same insulation level and no radiant barrier. However, in order to see such significant improvements in your home’s insulation measures and the resulting decrease in energy bills, you need radiant barrier insulation experts to ensure that your home benefits from proper radiant barrier installation. 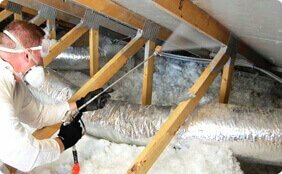 Completely free, with no obligation, consultation that includes a thorough inspection of your home's insulation. When you decide it’s time for your home to benefit from a radiant heat barrier, we’ll be ready. You can expect us to show up on time and without any hassle promptly begin on assessing your home’s layout, current insulation measures, and energy expenditures so that we know exactly how to create the perfect radiant barrier system for your home. We work efficiently, thoroughly, and courteously, always making sure to clean up any mess so that the only thing you get to look for when we’re gone is your lower energy costs. Our pricing is reasonable, our customer service is excellent, and we guarantee to leave your home in better shape than we found it. If you’re ready to experience the benefits of one of the most cost-effective ways to improve your home and reduce your energy bills, get started by setting up a free consultation with Dimensional Contracting’s radiant barrier installers.